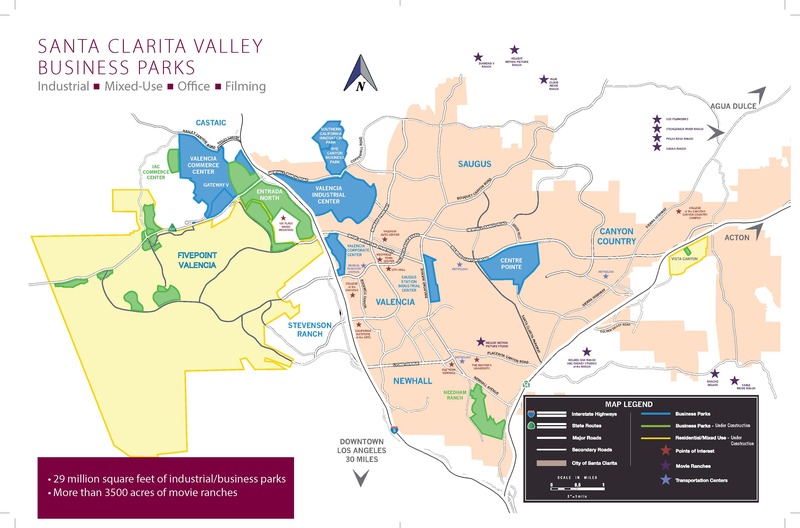 Today, the Santa Clarita Valley boasts nearly 30M SF of industrial and commercial facilities. Looking ahead, approximately 8M SF of future land development is approved, including 2M SF either in land development or with buildings under construction. Strategically located between Interstate Highway 5 and Route 14 and developed by Spirit Holdings, the Centre Pointe has a space of 185 acres and 1,650,000 SF for office, industrial and mixed use. East of Interstate Highway 5 and adjacent to the Valencia Industrial Center, the Highridge Business Park, developed by Newhall Land, has space for office, industrial and mixed use. This 70 Acre development is part of Valencia Commerce Center at the western terminus of Witherspoon Parkway. This IAC developed business park has 1.3M SF for industrial and commercial. Phase 1 is ready for occupancy. Located between Valencia Industrial Center and Southern California Innovation Park (formerly Mann Biomedical Park), Ryan Canyon Business Park, developed by Legacy Partners, has 3M SF for office, industrial and mixed use. Located on Railroad Avenue, this industrial center offers access to Interstate 5, Route 14 and the LA Metrolink station. Located just north of Route 14, The Center at Needham Ranch is developed by Trammell Crow Company/Clarion Partners and offers seven state-of-the-art industrial buildings with sizes ranging from 34,414 SF to 209,559 SF in Phase 1 which is now under construction. developed by FivePoint, the Valencia Commerce Center is located in the northwest quadrant of Interstate Highway 5 and Route 126 with a space of 1200 acres and 9M SF existing and 12M SF at build-out for industrial. Developed by FivePoint and just east of Interstate Highway 5, the conveniently located Valencia Corporate Center has a space of 75 acres and 960,000 SF for office, retail and hospital. Developed by FivePoint and just east of Interstate Highway 5, Valencia Industrial Center has 1100 acres & 11M SF for industrial, office and mixed use. With 60,000 SF Office / Retail Building under construction, delivery Q3 2019, this new transit oriented mixed use development, “Town Center East," will be located off Highway 14 with direct access to a future Metrolink station. Ideally suited for companies in bioscience, medical device and high-tech industries, this park is under development by Intertex Companies and Oaktree Capital Management, L.P. Existing GLA is 612,075 SF with 900,000 SF entitled for expansion.